Juneberry Lane: Hello & Hooray!! Whew! Two days of holiday traveling madness and I am just finally beginning to come back to my senses. Toddlers and layovers just don't mix, by the way. But luckily, we will be back tomorrow with a whole bunch of inspiration fun! There is nothing better than being home for the holidays and receiving wonderful news . . . and tonight we got the best news ever, that my sweet little sister, Meggie (you know, the one who is always sending us that amazing baking inspiration?) Well, she just got engaged this evening . . . and you know what THAT means. Tons of wedding planning fun . . . and bridal showers, engagement parties, and bachelorette parties too!!! I am so excited. 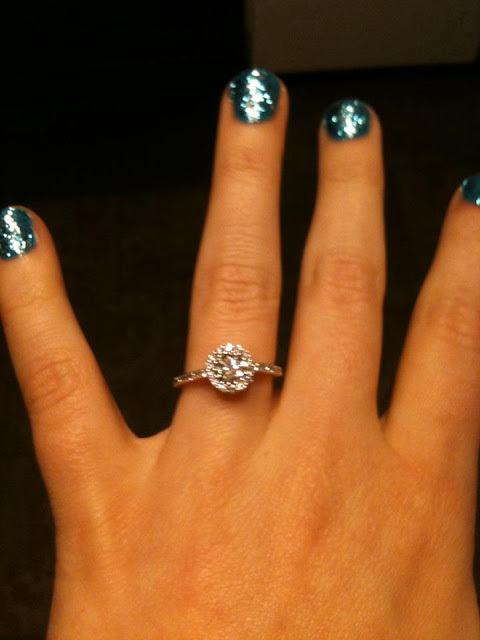 Just take a look at this gorgeous ring . . .
And yes, that is "Going Gonzo" from the Muppet line by OPI, in case you were wondering:) Hooray!!! See you tomorrow!